If I was stranded on a desert island and could only have one tart to eat forever, this is the one I would choose. If I go somewhere where I’m supposed to bring the dessert, this is the one I bring. The brown butter is what sets this apart and makes it nutty and deeply rich-tasting. I have made it with frozen and fresh berries with success, but if you can find fresh, just picked berries at your farmers market, they are what will give you the ultimate result. And if you can get the little wild berries, as opposed to the big cultivated ones, then you are really in for a treat. Taste the berries before you buy them. If they are bland and watery, wait until you can find some that really pop with intense blueberry sweetness. I made this tart last Christmas, which is when this photo was taken. Our family ritual at Christmas is for everyone to bring an appetizer, I make the dessert, and we order Thai take-out. Everybody gets to order one dish from the take-out menu, so there is tons of food and at least one dish that each person loves. And it is delivered! No kitchen mess! With all the dietary quirks and requirements in my family (I detailed this in my Thanksgiving post), this method takes the pressure off me and we can all focus on the most important aspect of the day: OPENING THE PRESENTS! In fact, now that I’m looking at this photo and reading the recipe, my mouth is watering and I’m going to have to make this again very soon. I usually wrap the bottom of the 10-inch tart pan with aluminum foil and put it in to the freezer for 15 minutes. Then I paint the inside with melted butter and return it to the freezer until I am ready to fill it. The foil keeps any melted butter from leaking out into your oven. 1. Preheat the oven to 350 degrees F. Make the pâte sucrée. See below. 2. To make the filling: Melt butter over medium heat until a brown sediment forms at the bottom of the pan, about 3-5 minutes. The butter will be a dark golden color and have a rich, nutty smell. Set aside to cool. 3. Combine eggs, sugar and flour in a food processor. Process until smooth, about 5 seconds. Pour in warm butter and process briefly until combined. Add vanilla, process 5 seconds and set aside. 5. Dust with confectioners’ sugar and serve warm or at room temperature. 1. Slice the butter into thin coins and combine with the flour and sugar in a food processor fitted with a metal blade. Process until the mixture has a mealy texture, about 30 seconds. 2. Combine the egg yolks and vanilla in a small bowl. Pour over the flour mixture, pulsing 15 to 20 times to combine with other ingredients. When the dough begins to clump together and form little balls, it is done. It should not form a ball around the blade. 3. Form the dough into a 1-inch thick round disk and wrap in plastic wrap. Refrigerate a minimum of one hour or as long as a day. Well-wrapped in plastic wrap and foil in a ziplock bag, the pâte sucrée may be frozen indefinitely. Yields two 9-inch tart shells or one 10-inch shell plus two miniatures or cookies. This looks like a wonderful holiday dessert. It looks almost like a chess pie. But with the blueberries, way better! I just wanted to let you know how wonderful this recipe is…and so easy to make. 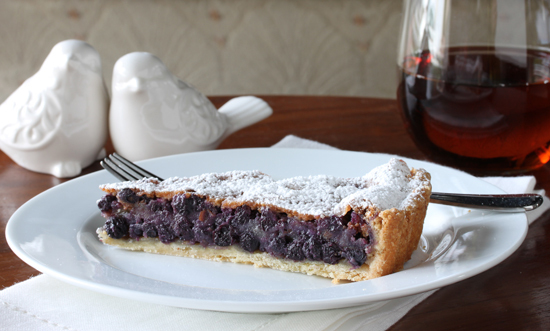 I worked at a wonderful restaurant for years which always had a blueberry brown butter tart on the summer dessert menu and I was so happy to find a recipe for one on your site. It’s now my go to warm weather dessert! (the addition of nectarine’s really works too!) Thanks!